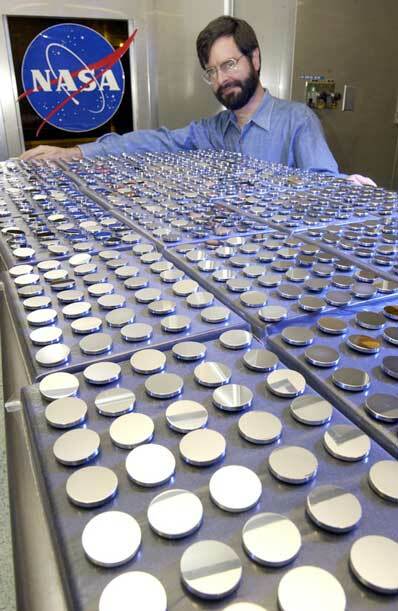 Optical physicist Vince Huegele of NASA's Marshall Space Flight Center in Huntsville, Ala., inspects some 800 of roughly a thousand mirrors ready for assembly onto Starshine 4 - a space-bound satellite which, when ready for launch, will resemble a high-tech disco ball. Students from hundreds of schools in 43 countries smoothed and polished the mirrors to make them reflective. They were then coated by Marshall's Space Optics Manufacturing Technology Center to prevent their reflective surfaces from tarnishing in the harsh environment of space. The mirror-covered satellite is set for launch January in 2003 on the Space Shuttle Atlantis during the STS-114 mission to the International Space Station. Orbiting the Earth for several years, Starshine 4 will reflect sunlight to observers on the ground, so that students participating in the educational program can study the effect of solar activity on Earth's atmosphere. This satellite is the fourth in a series. The first Starshine satellite orbited the Earth from June 1999 until February 2000. Starshine 2 orbited the Earth from December 2001 until April 2002. Starshine 3, launched in September 2001, is still in orbit.